Gerbil Food List - What to Include? Gerbil food provides all the nutrients that your pet needs as long as a well rounded diet is given. You will find commercial foods in boxes and bags which include a mix of different ingredients, and these will work well as the base of the diet for your gerbil. A gerbil diet should also include a variety of other foods as well, such as fresh fruits and vegetables, whole grains, cheeses, dog biscuits, and even mealworms or other small feeder insects. The gerbil food that you offer should include a wide variety, so that your pet enjoys eating and does not get bored with a monotonous diet. Proper gerbils care will include small amounts of fresh fruits and vegetables, as well as a staple of pellet or block food. Rhubarb and onion should not be offered, but others including carrots, apples, celery, raisins, all types of berries, and many other choices should be included. Try to give your pet a range of colors and tastes. Seeds are also an important component of gerbil food, and nuts are a favorite treat for most of these animals. Breakfast cereals can be given when you keep gerbils as pets, but try to avoid sweetened cereals and stick with whole grain options instead. 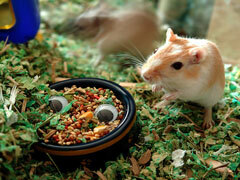 Gerbil food should contain a big variety, and this will encourage your pet to eat a healthy diet. Small feeder insects, such as mealworms and baby crickets, are included in the wild diet of a gerbil and can be given occasionally for a treat. These insects will stimulate the gerbil as well as provide food, and can be placed in the gerbil cages in the evening. Any insects not eaten within twenty four hours should be removed, and fruits and vegetables should only be left while they are fresh. Offering your gerbil many different choices you will keep mealtime interesting and ensure that your pet stays healthy.